Today was a positively wonderful day and I am planning on having two more perfect days. Today, my fellow research assistants and I went to WBRU's Guster concert to hand out fliers to potential research participants. You read right, I got to go to a concert on company time! I should also mention that we got VIP passes, so we could go backstage and eat free food and drink free drinks (including beer, if you are oh so inclined). So let me recap, I got to go to a concert for free, eat free food, drink free drinks, even drink alcohol on company time (not that I drink alcohol, but I could have), and get out of work early. Yes, I did have to hand out fliers for 45 minutes, but I can handle that for all the freeness. 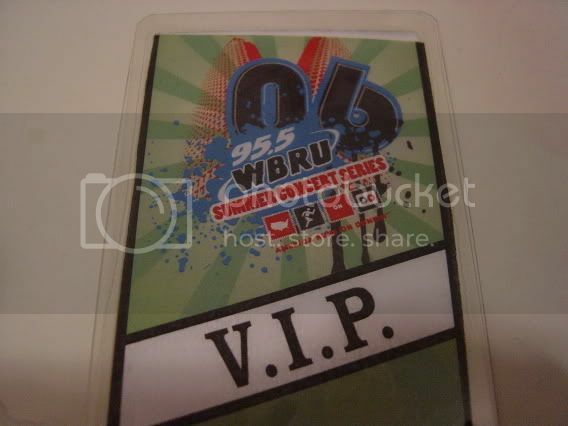 Okay, yes, it isn't really free, since my office is paying WBRU to be at the events and advertise on the radio station, but it is free for me! In knitting news, when I came home like the good girl that I am, I worked on Twizzler for a bit. I just need one more knit row and two more purl rows and then I can move on to pattern #2! Here are two pictures of my progress. If you combine the two pictures in your head, you will get the actual color of the yarn. I must admit that it is slightly disheartening to knit only two rows and see that an hour has passed. Maybe I will knit another hat this weekend and remind myself that yes I can complete an object every once and a while. It's pretty darn hot to be knitting hats! Actually, it's pretty darn hot and sticky to be knitting anything! So what did I work on last night? Wool socks. I want to get them finished so I can wear them to work where the air-conditioning makes it mighty chilly in some spots. Hey, sounds like the concert went well (though I guess the real test is seeing how many people phone in about the study)!